Online social game Roblox has reinstated PewDiePie's account after banning the popular YouTuber over an "inappropriate username". Other users then reported that they had received bans or warnings simply for mentioning the YouTuber's name. PewDiePie's account was eventually reinstated, with Roblox calling the ban "incorrect". "Roblox is committed to providing a safe and civil platform for our players, including blocking memes that represent or are synonymous for behaviour that falls outside of our community standards," it said in a post on its developer forums. "In December, 'pewdie' became one of these negative memes on Roblox. As such, we began blocking the creation of new usernames that incorporated the term. "The legacy account that PewDiePie used in his livestream was incorrectly banned as part of the administration of this policy." Even before PewDiePie made a video announcing the ban, several people took to social media after they noticed a "purge" on anything related to the YouTuber. Others said that they had received bans for writing "subscribe to PewDiePie" in the game's chat. And Roblox player Rogos, who features in PewDiePie's video, said that his account was disabled simply for writing "hi PewDiePie" when he saw the popular YouTuber in-game. 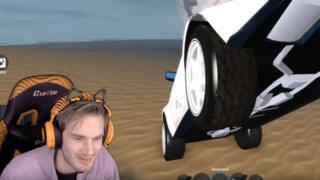 Meanwhile, some of the game's players have questioned the authenticity of the "pewdie meme". "I have never seen anything like that on Roblox," said KonekoKitten in a YouTube video. "Back in 2018, in December, not once did I see it." It may refer to the "subscribe to PewDiePie" messages that became ubiquitous with the latter part of last year. "The 'pewdie' ban is not in the rules," said Ericzona on Twitter. "Why was there no public warning for this ban?" It is not clear whether users will face sanctions in the future for discussing PewDiePie in the game platform's chat.